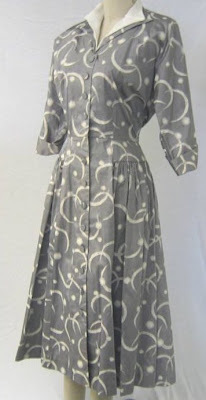 A 1950's day dress by Anjac of Los Angeles is a perfect example of a mid-decade look for adult women. The wing collar is doubled, with a white top collar to frame the face. Classic 3/4 length sleeves have turned back cuffs. The center front closure is dotted with self covered buttons from the "V" neckline to hem. A slender body silhouette is achieved by having the fitted torso with dropped waistline. This is a silhouette similar to what we see in Givenchy's designs for Audrey Hepburn ("Love in the Afternoon" and "Funny Face", 1957). By lowering a gathered skirt to the hip bone, the waistline doesn't look bulky and full. The unique fabric pattern is screen printed in white on what seems to be an acetate textile with some shine in soft gray. The fabric texture enhances the dress design, creating emphasis for the skirt folds. The dress's label is designed to promote California fashion. 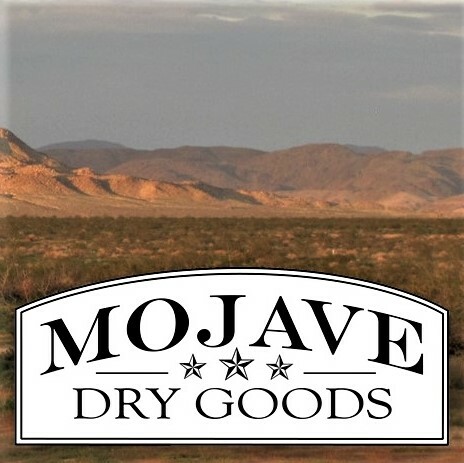 This marketing technique was popular among companies in the region who hoped to see their products displayed in "California boutiques" at department stores throughout the US. The Anjac label was designed in Los Angeles for over 30 years. The company was founded by Jack Needleman, who named his new apparel company by combining his name with his wife Annette’s. Needleman had moved to Los Angeles with his wife in 1943 from New York City. In New York he worked in the apparel industry as a jobber. Although Anjac was begun to produce dresses, his business focus would later center on more profitable real estate transactions in the Garment District. By the 1960’s this was to become the force of his business. Anjac designer, Ilse Metchek, joined the company in 1967. She arrived from Catalina, having worked there designing sportswear. At Anjac her profitable styles financed Needleman’s property expansions in the garment district where he would build an empire that exists today and includes many important historical buildings in the area. He would pass away in 1999, the properties now managed by his family. 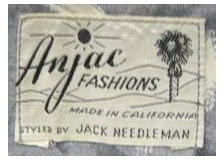 Needleman maintained the Anjac label until 1984, when he sold it to Metchek. Under her leadership the company was renamed “Ilse M. Inc”. Metchek designed for her label until 1990 when she gave it up to take a position as president at White Stag. Today Ilse Metchek is president of the California Fashion Association in Los Angeles, which she formed in 1994 to promote unity and compliance within the local apparel industry. How to sew with couture techniques is a hot topic right now, as is just about anything with a "Couture" label. But true couture, that specialized apparel design system that is the property of the French is a unique breed of fashion. Similar construction can be found in fashions from other locations, of course. But all must attain a level of excellence that is rarely found in apparel construction. Claire B. Shaeffer is an historian of couture who lives and breathes this medium. She is a prime expert in the field, especially in the area of construction technologies. Her book in the subject "Couture Sewing Techniques" originally published in 1993, has been one of the top references for sewing couture fashions. This spring her edited version has become available. This edition seems flawless in scope and detail so it's difficult to imagine what might have been 'left out' in content. Techniques are shown both in detailed lined drawings and with colored photos. The historical couture fashions are great to see, and bring a high level of authenticity to this work. The topic of couture sewing is covered so completely that the book should become a 'must have' reference for any fashion sewist. A second book with essentially the same title: "The Dressmaker's Handbook of Couture Sewing Techniques" falls short when compared with the Schaeffer edition. Perhaps the editor felt that putting "couture" in the title was necessary to sell books? Whatever the reason, the title is misleading. The techniques in this book are shown in step-by-step format with full color photos, and there are runway photo accents. This is a very visual book that captures the excitement of couture fashion. What this book contains is a variety of fashion sewing techniques. The flow and content order in this book seem out of alignment. It begins with methods for bindings and finishes (that include techniques for knits), it ends with "Essential couture techniques". "Making a muslin" is in the final two pages before the glossary begins. How can we end a book on couture sewing with the most important part of any fashion sewing experience: the pattern and fit? And why are "essential couture techniques" the last chapter? I would also ask why a couture book includes knits. While knits are part of the current couture line-up, the techniques we are shown belong in a sportswear text, not this one. Overall, this would be better if it had been marketed as a fashion sewing handbook, although even then it would need more instruction into the art of fitting and pattern selection. The author is known for her fitting techniques, so perhaps that is another book.